GOLD WORCESTER BOSCH Accredited Installer and we can offer up to 10 years parts and labour guarantee on new boiler installations. I established the business in 2006 , although before setting up my own company I worked for British Gas as an engineer and quickly progressed to become a senior technician. In this role I had a team of 15 engineers in which I had to manage and also deal with the more technical jobs and provide training for my team. I therefore have extensive knowledge within the industry. We offer a professional and competitively priced service and are Gas Safe registered. We believe we operate on a high referral basis and that much of our business is through recommendations from our customers. Andrew came twice in two years, once to change a water pump and this week to change a defective air pressure switch in our boiler. Both time he was able to come and see us the same day we called him and fix the issue the following day (after having ordered the necessary parts). He's a reliable tradesman who we would be more than happy to recommend to our friends and family should they ever need a plumber/gas engineer. Arrived on time. Very tidy work. Strong workmanship. Removed his shoes - so carpet clean. Final price as quoted. Would strongly recommend. Andrew's chosen work is heating rather than plumbing. Andrew was called in emergency since the old boiler had repeated flame failures. He turned up after 20 minutes, checked the boiler meticulously, cleaned a couple of parts and sorted the problem without extra spending. Very happy with the service! Andrew is very professional in all aspects of his work, from the quotation through to completion of the job. He replaced a gas boiler and, because he is Worcester Bosch accredited, included a 7-year warranty, more than other companies had quoted. He was also less expensive than others and his solution for routing the condensate pipe was much neater and less disruptive than others had suggested. He worked hard throughout the day and cleared up all mess thoroughly. We are happy to recommend him unreservedly. Excellent job carried out on the heating system. Good communications, came out as arranged and sent through quote promptly. Arrived to do work fully prepared and on day agreed. Was more than happy to answer all my questions. Professional, reliable and very knowledgeable. Excellent find. More than happy to recommend. 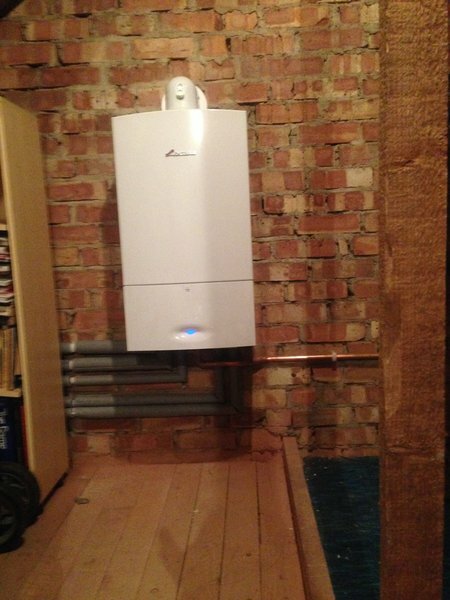 Andrew fitted a new boiler for us and we found him very reliable. The price was very competitive and the service excellent. Job done in a day and a half and everything left clean and tidy. Also had a few plumbing jobs too. Will definitely use again. Good time keeping, reliable, Good Communication, Gives excellent advice and provides recommendations as necessary. I've used Andrew over the last 14 months for a boiler service and emergency call out for central heating repairs. Andrew sorts out any issues immediately. I've used him for a service and replacement parts of my boiler. He's also carried out plumbing work for me. He is reliable and prompt, personable and polite. He is honest and will always try and repair where necessary rather than ordering replacement parts. He does the job he has been asked to do and is respectful/considerate reliable and trustworthy.